A ceiling is a surface that is always visible, and its design significantly affects the perception of the interior. It is an important part of the design of the room. 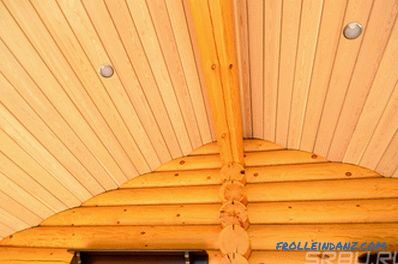 When deciding how to sheathe the ceiling in a wooden house, it is necessary to take into account the peculiarities of its design and the behavior of wood as a building material. Wood is a rather capricious material. Wood never becomes completely static. It is affected by changes in humidity, which cause variations in the dimensions of parts. Especially strong changes in the size of the new structure, until the moisture content of the wood from which it is built, did not come to an equilibrium value. 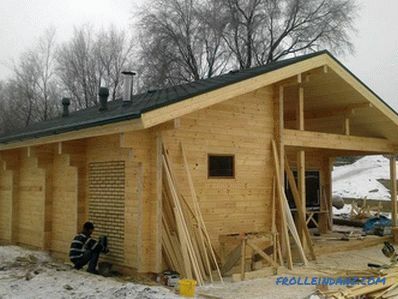 A new wooden house always undergoes shrinkage, and this process takes from several months to a year or even two, depending on the quality of the wood and the nature of the structure. The greatest shrinkage gives a felling of the "wild" logs. Profiled and glued timber "sits" a lot less. Almost no shrinkage in frame houses, but in this case it is not zero. 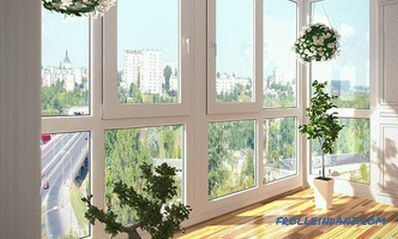 Usually, finishing works are not performed until the end of shrinkage, but if necessary, finishing can be done immediately, using special installation techniques that allow painless displacement of structural parts during shrinkage of the house. After shrinkage, wooden structures also retain some mobility due to size fluctuations, which, as a rule, occur as the seasons change. 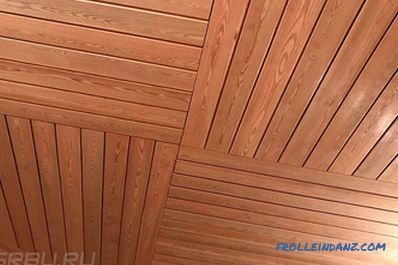 Different materials are used to finish the ceiling of a wooden house. 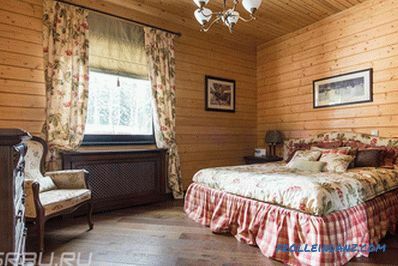 The preference is most often given to wood, since it most closely matches the very idea of ​​a house built of wood. ensuring some mobility in the absence of cracks. The paneling is sewn onto the crate, the pitch of which is determined by the thickness of the slats. Usually it is 500-1000 mm. The edges of the individual slats have shaped profiles that form a thorn-groove joint. The surface of the lamellae does not mask the joints, but even emphasizes them, turning them into a kind of embossed decoration. This allows you to leave between the slats technical gaps that never turn into cracks. Unedged board is a board with a natural edge that is not aligned with trimming. Uncut edges are never straight and usually have an oblique profile. Laying such boards end-to-end without additional processing does not make sense, since there are very large and uneven gaps between them. But you can sew unedged boards with overlap or in two layers. In the first case, a relief-like surface is formed, resembling scales, due to uneven edges overlapping adjacent boards. In the second, approximately the same effect is created, but without a pronounced direction, except for the direction along the boards. 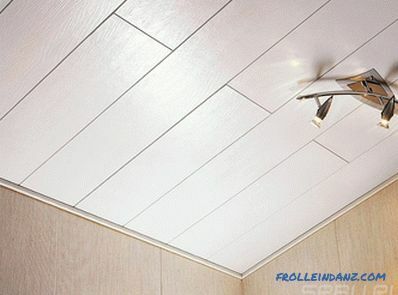 Unedged board has always been considered to be a draft material, suitable only for technical use, but not for finishing. However, the dominant concept of aesthetics is clearly drifting towards natural materials and natural lines. This gave a new life to the decoration with a demonstratively low degree of processing, including boards that did not pass through the edges. Before use, unedged boards must be freed from bark and cambium, side cracks and flakes are removed on them. According to modern standards, they are treated with antiseptics and fire-impregnated. Ceiling decor is a matter of design. 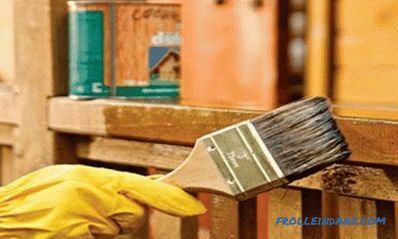 As a rule, wood is tinted or undergo another treatment, for example, artificial aging with the help of abrasive brushes. Toning allows not only to give the casing the desired color, but also to show the wood structure, and the varnish coat fixes the chosen decor, prevents its aging. The use of unedged boards is the original answer to the question of how to sheathe the ceiling inside a wooden house cheaply and beautifully. Planken is a wood-based material used for covering facades and frame structures. Planken in German means "boards". So, there is nothing fundamentally new in this material. 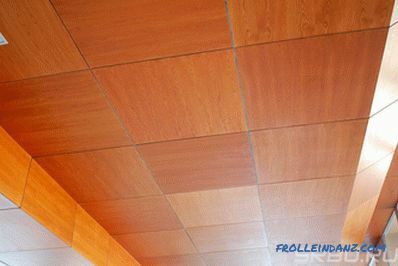 The main differences between planken and ordinary planks are good drying, high-quality surface treatment and a special shape of edges with corners rounded with a radius of 3-5 mm, so that there are no edge chips and flakes on them. 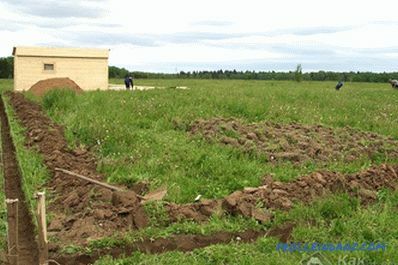 The longitudinal ends of the planken can be straight or oblique. The oblique edges with a slope of 30-45 0 , well remove moisture when covering the facade with a horizontal arrangement of slats.When facing the ceiling, oblique edges can also be useful, as they mask the through gaps. Plancken is sewn onto the sheathing, just like ordinary boards or lining. There is always a small gap between the slats to compensate for seasonal changes in size. No locks hiding gaps, are not provided. Fastening the slats can be hidden, as in lining, or cross-cutting. In the latter case, the fastener heads can be masked or vice versa, used as an additional decor and highlighted in color. 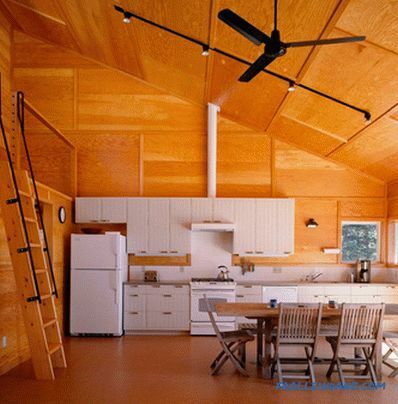 Plywood is a sheet material that gives a significant advantage over linear length gauges - boards or clapboard. The cladding plywood allows you to get rid of the line relief and joints, to make the ceiling smooth. It is still not possible to do without joints, since sheets are usually not larger than 2500x1250 mm. However, the number of joints per room is already measured in units, and not in tens and hundreds. High-quality plywood has a smooth surface with a woody structure, which in itself serves as a good decor. 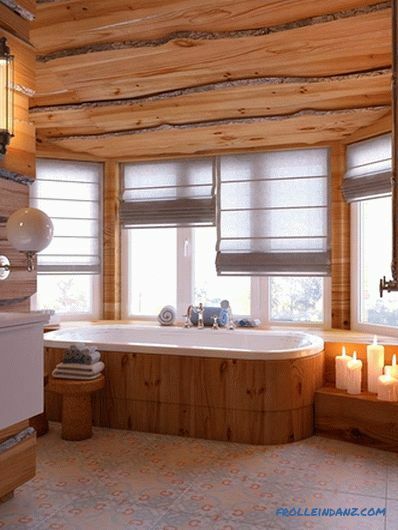 In addition to the usual plywood, you can use laminated sheets covered with a decorative layer. 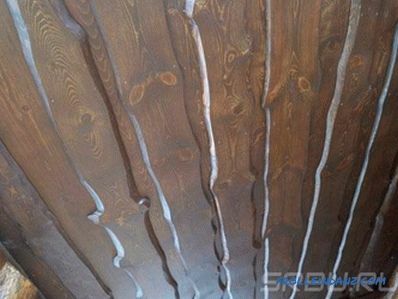 In this case, the ceiling plating does not require any treatment, even grinding and varnishing. Low-grade plywood, which has many knots and other defects, can also be used, but in this case you need to take care of the decor. You can, for example, paste over the plywood trim. 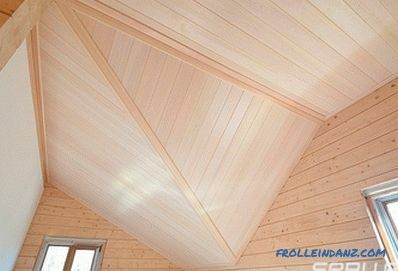 In search of what to trim the ceiling in a wooden house, you should pay attention to the MDF cladding panels. MDF is a good substitute for wood. This material is made from finely chopped wood waste, which is bonded to the slab with carbamide resins added to the mixture, and lignin, which is released from the wood fibers when heated, accompanying the molding of the material. Cladding panels can be made of it in various sizes - from narrow slats, like clapboard, to large panels, the size of which is limited only by their ease of installation and the ability to provide the slack, which is necessary in order to avoid distortion of the skin . MDF panels are decorated with color or vinyl film, on which any pattern is applied. Drawing tree structure - just one of many options. In addition to the pattern, the texture that also serves as an ornament can be printed on the surface of the plates. Moreover, any relief can be created on the surface of this material with the help of milling, which further expands the design possibilities. Here we have significantly moved away from the priority of "woody" design in the interior. 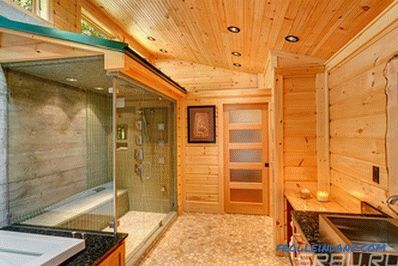 The dominance of wood in the interior of a wooden house is very popular, but is not mandatory. In addition, wood is very well combined with modern materials, which can also be used to create an interior. the ability to create any form - from flat surfaces to light cornices and multi-tiered ceilings. Drywall is mounted on a crate of metal profiles or high-quality wooden bars. Metal frame preferred. It is not much more expensive than high-quality dry lumber, but more reliable, and special profiles are much easier to work with. Plasterboard finish has no joints, like lining, plank or MDF panels, so it is mounted so that there are 5-10 mm gaps between it and the walls, which are closed with a baguette. The joints of drywall sheets are sealed with a special plaster composition on a reinforcing tape, the entire surface is also filled with a thin layer, and then painted. 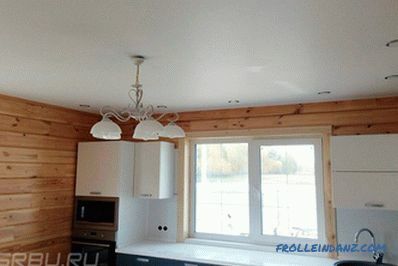 A plasterboard ceiling decorated with false beams looks very impressive in a wooden house. In modern construction there is a tendency of transition to high-tech materials, the use of which does not require much labor, and the quality of the result is provided "automatically." Such materials include drywall, discussed above. Stretch ceilings - the next step in this direction. Stretch ceiling is a special canvas and fastening system for it. The principle of creating a stretch ceiling is simple.Along the perimeter of the room, special profiles are fixed on the walls, in which the canvas is then fixed. Then this canvas is stretched, forming an almost perfectly flat plane. All basic structures - floor beams, rough plating, heat insulation remain behind the trim. They do not need to align, take care of their appearance, it is only necessary to provide for the installation of fixtures for chandeliers or other hanging parts. Chandelier and other elements that should be placed on the ceiling, are suspended from the intermediate mount, which transmits the load to the basic structure of the ceiling. There are two types of stretch ceilings - vinyl (film) and fabric. Vinyl is mounted in a weakened form and then stretched by heating the air in the room using a special installation. Fabric ceilings are stretched due to the special design of mounting profiles. Vinyl stretch ceilings do not allow air and do not tolerate low temperatures. 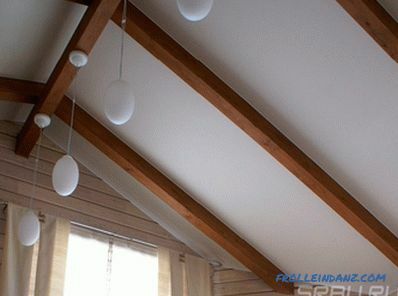 Fabric ceilings do not have all these drawbacks and they are best suited for finishing the ceiling in a wooden house. The possibilities for decorating vinyl stretch ceilings are almost endless. They can be glossy or matte, monophonic or decorated with drawings of any complexity, up to full-color printing. If you wish, you can order any image by submitting it in electronic form. And all this does not require the performance of complex work. The decor is created on special equipment in the factory, and the installation on site takes from a couple of hours to a working day, depending on the complexity of the work. 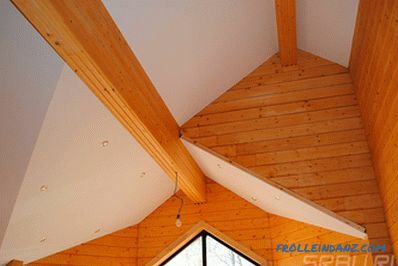 Choosing the better to sheathe the ceiling in a wooden house, you should not be limited to traditional materials only. You can weave tradition into modernity, creating a unique interior. A little imagination and a combination of different possibilities are able to create a home in which you want to stay.